The dramatic and distinctive landscape of the Dolomites beckons hikers from all over. The Dolomites are a mountain range in the northern Italian Alps with breathtaking views and a network of superb hiking trails. 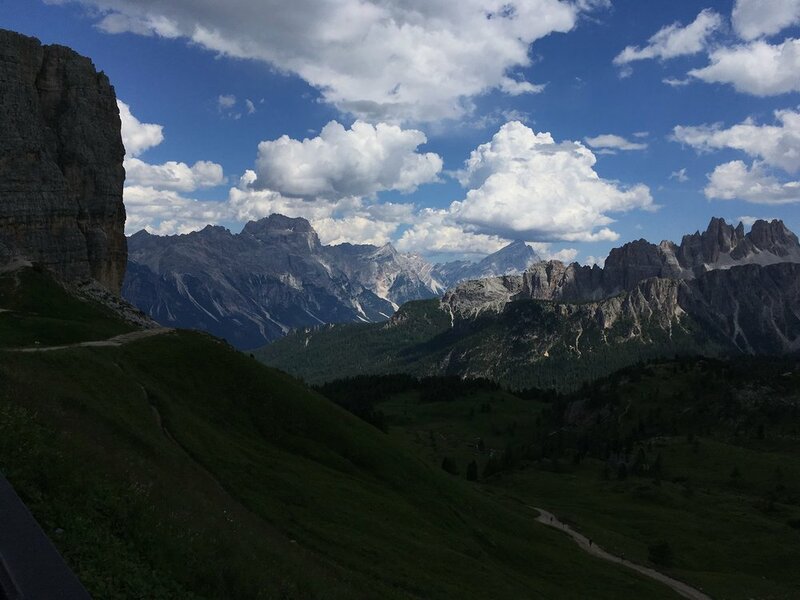 The Dolomites are a mountain range in the northern Italian Alps and their dramatic and distinctive landscape beckon hikers from all over. Their pale colored majestic spire peaks, high passes, labyrinth rock areas, mirror lakes, and an excellent network of well-maintained trails with an abundance of Rifugios, are a hikers oasis. They are breathtaking with magnificent views, massive rock towers and green valleys flecked with many varieties of wildflowers, often with brilliant deep hues that you do not find elsewhere. There are several national and regional parks in the area offering superb hiking trails. The region is still scattered with abandoned World War I bunkers and fortifications and there are many open-air war museums, making for a fascinating history lesson. Join us in exploring the rugged and wild beauty of these mountains – the splendor of the spires, the high mountain meadows, spectacular ridges and always exhilarating views. 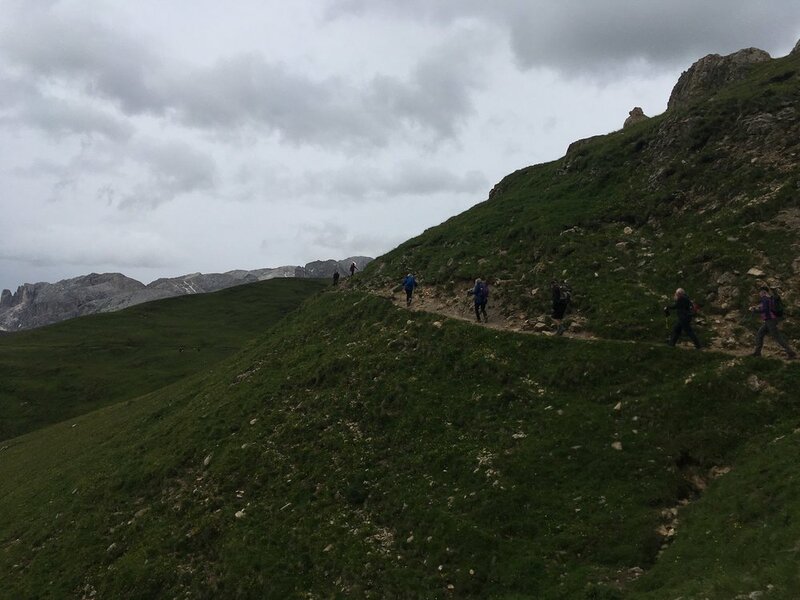 We walk five days and have a free day to do as you please from our center base in the Val di Fassa Valley in Northern Italy. 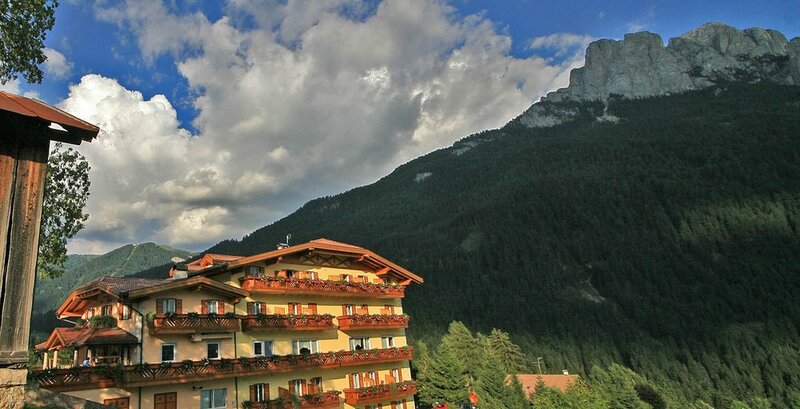 We are based in Vigo di Fassa, a small village in Northern Italy where we will stay in the Hotel Al Piccolo, a family run three star superior hotel located a short walk from the village center. All rooms are en-suite and include a television, hairdryer, telephone, and the usual amenities. The hotel also has a wellness center with a sauna and small gym, table tennis, bar and lounge, and restaurant. Wi-Fi is available throughout the hotel. Breakfast is a self-serve buffet and offers a wide range of freshly baked breads and pastries along with a rich and healthy variety of breakfast choice foods to start your day. 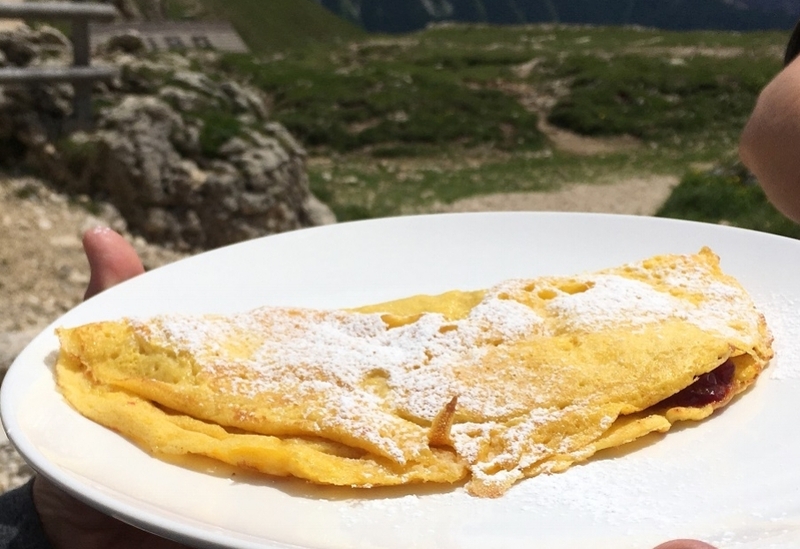 Lunches are at your expense where we typically stop at a Rifugio along the trail. 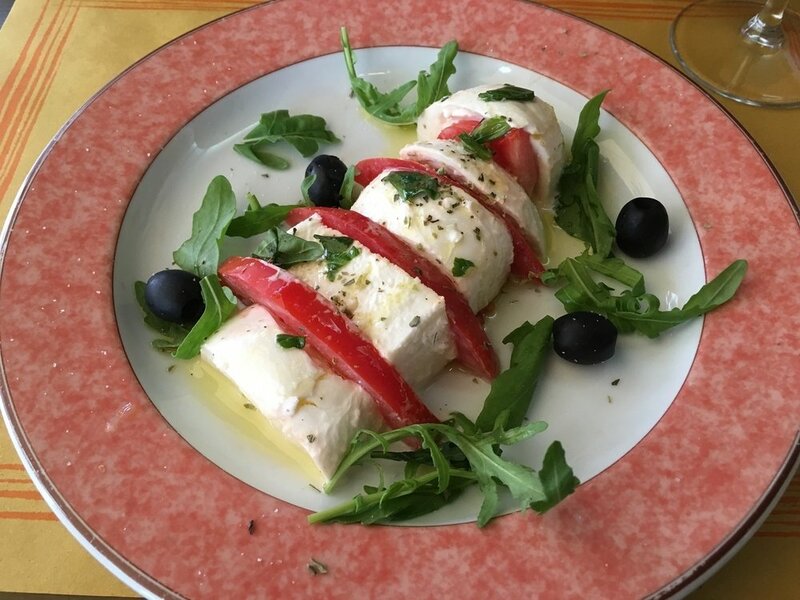 The Rifugios serve traditional regional specialties and are home-made from locally produced ingredients. Dinner is a three-course affair served in the hotel’s restaurant, offering traditional Italian foods with Trentino area cuisine specialties. Transfers between the hotel and Verona Airport on arrival and return transfer upon departure. There may be an option to transfer from Venice, Italy or Innsbruck, Austria and we can help with the arrangements. Transport to and from each day’s walk (mini-bus, cable cars and local buses). This is a land only holiday so your flight to and from Verona is not included. We are happy to assist you with providing flight information from your local airport. 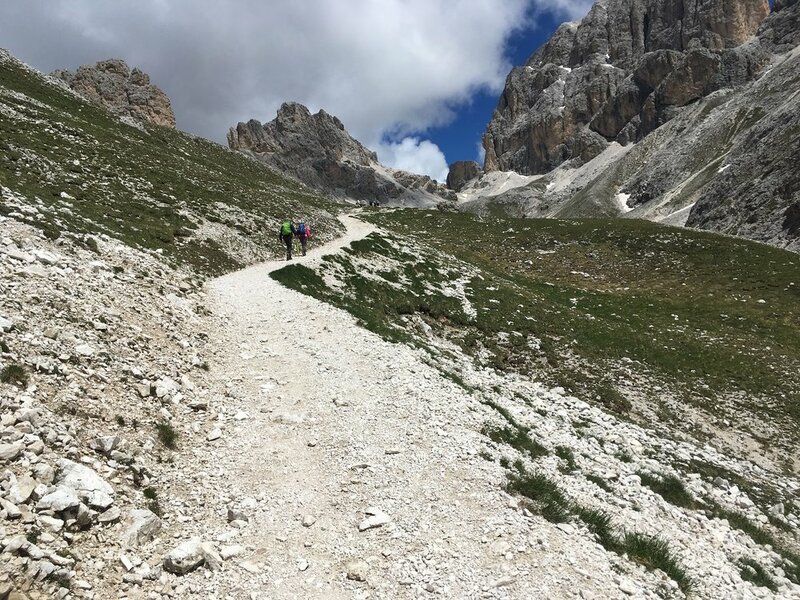 The Fassa Valley (Val di Fassa) offers access to a broad selection of outstanding walking with many side valleys to explore as well as high passes amongst the distinctive Dolomite peaks. There are also beautifully colored lakes enhanced by the mirror reflections of the mountains against a backdrop of pine forests. Above the forests are meadow lands where cowbells are often not too far away and these extend to the foot of the stony spires of the Dolomites where we walk, high above the valleys below. Great care has been taken selecting our routes to ensure our guests enjoyment and safety. 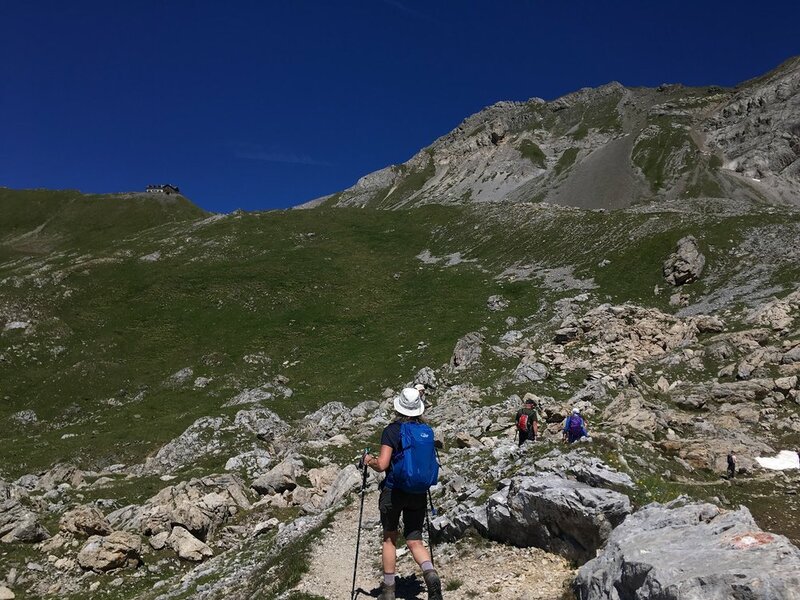 Due to the challenging nature of the mountainous terrain, we rate the walking as moderate with some steep ascents and descents so a good level of walking fitness is strongly recommended. 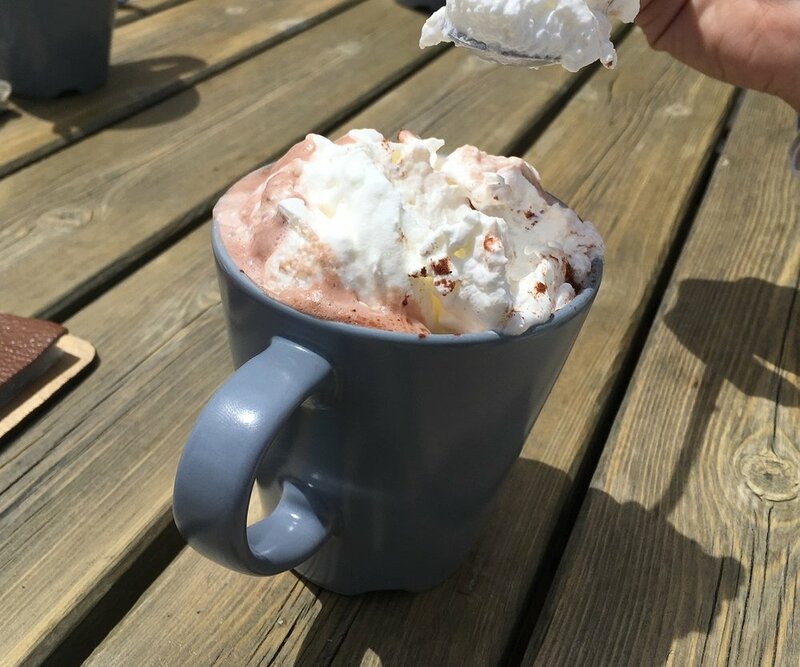 This will greatly enhance the enjoyment of the walking holiday. The terrain is good and varied but all offer a solid foothold. Climbing at times is steady with the occasional steep stretch. We don’t rush and take frequent water breaks and to enjoy the spectacular views. Five days walking during the week and one day as a free day to do as you please. There are opportunities to explore the area further with some guests visiting the village shops, cafés and there is the Museum of Local Culture. 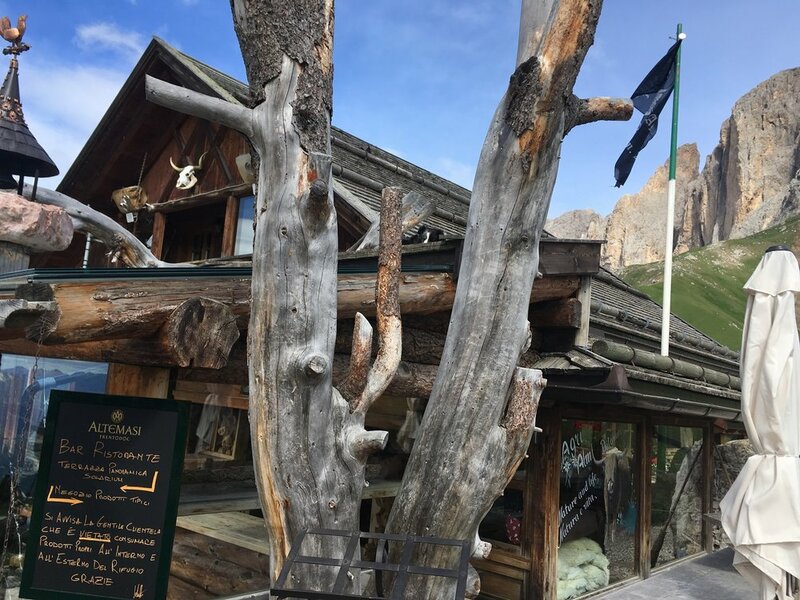 A short bus ride away is the town of Bolzano where you will find the world famous “Iceman Museum” where Otzi and his artefacts are exhibited. Or you may choose to rest and take advantage of the hotel’s facilities. We walk starting between 9:00 and 9:30 and end about 4:30 in the afternoon. We take transport to the walk start and walk for about 5 to 7 hours at altitudes of between 2,000m and 2,600m (6,500f to 8,500f). We take breaks along the way and always stop for lunch at the beautifully located mountain Rifugios where we enjoy local traditional cuisine and regional specialties. We use the excellent network of cable cars to get high quickly, as well as the reliable buses to and from some walks. Our outstanding range of 'classic routes' will delight all keen walkers wishing to discover the rugged wild beauty of these mountains. 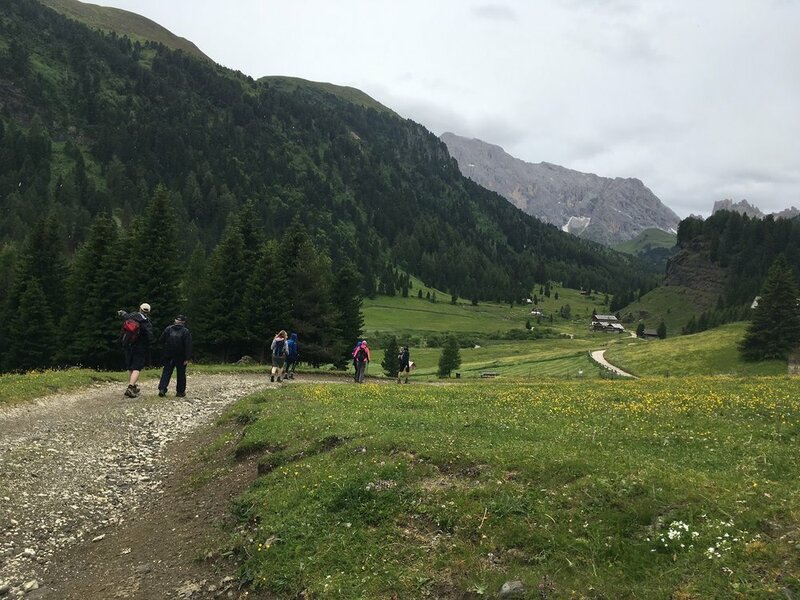 After a short bus ride to the Passo Costalunga (1745m/5725f), our walk starts steep up through woodland then across meadows to Rif Paulina (2125m/6972f). After a short break the path contours to the lunch stop at Rif Roda di Vael (2283m/7490f). 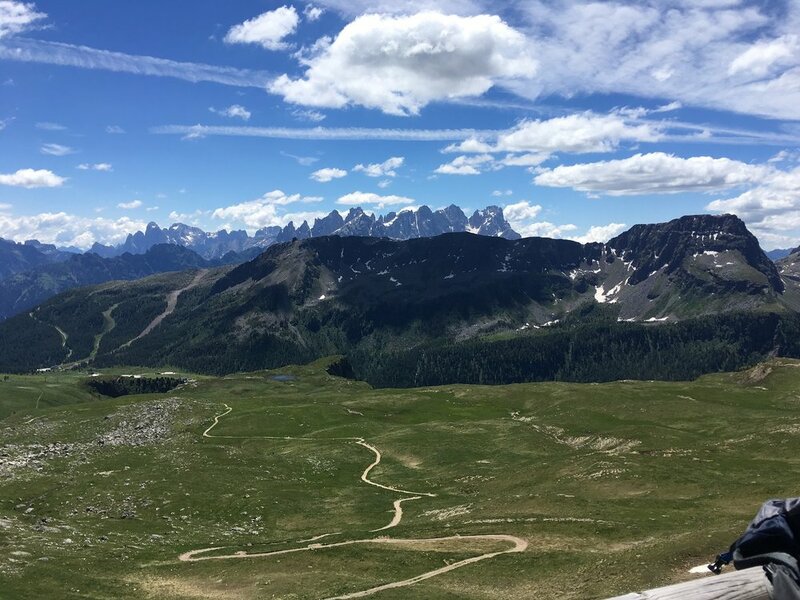 The afternoon walk is all downhill, again crossing meadows and through woodland offering a wonderful view over Vigo di Fassa. A minibus will take us to our next day’s walk down the valley and on to Passo San Pellegrino (1907m/6256f). 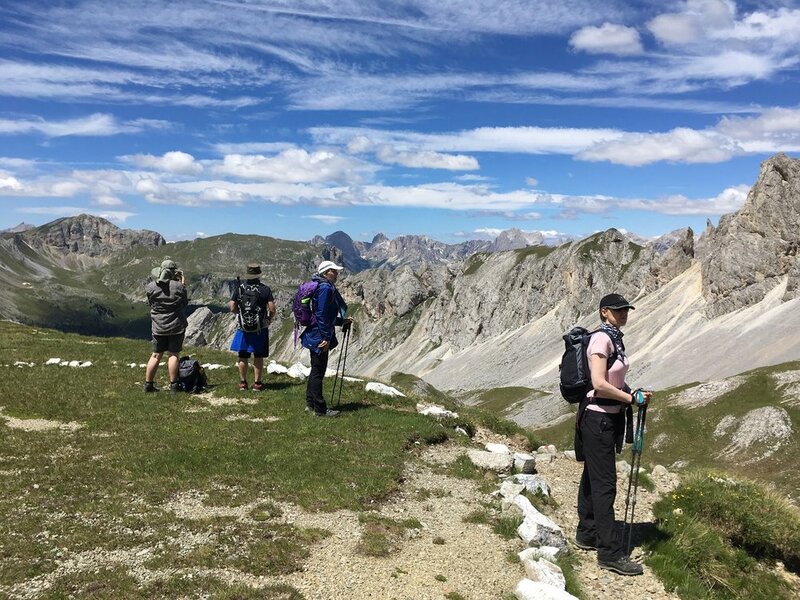 The walk takes us across the winter ski slopes to the spectacular ridge and Rif Passo delle Selle (2528m/8294f) where there is still World War 1 evidence. After the Rif it's downhill via Valle del Monzoni to Pozza di Fassa village followed by a 45 minute riverside walk to Vigo. 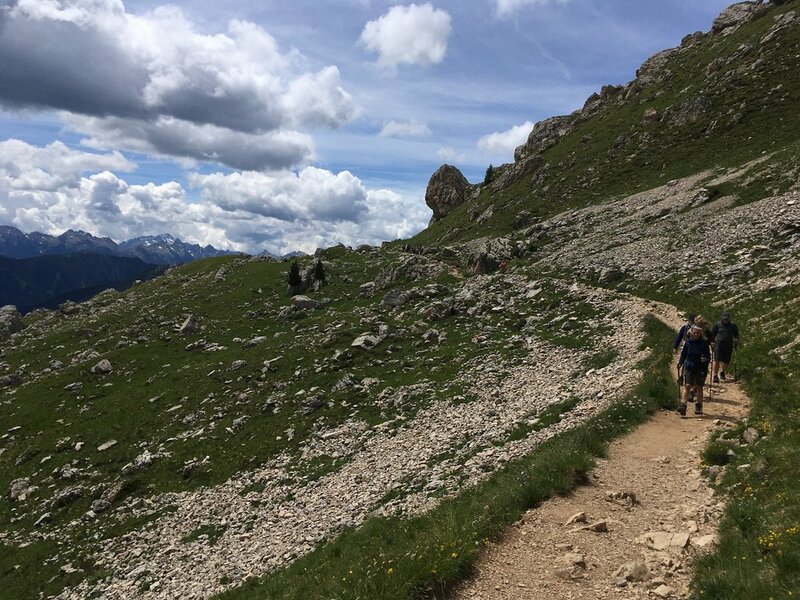 We take the cable car to Ciampedié (1990m/6529f) and walk a wooded path crossing ski slopes then up the spectacular Val de Vajiolet. We will head up to the Passo Principe to stop at Rif Principe (2599m/8527f). 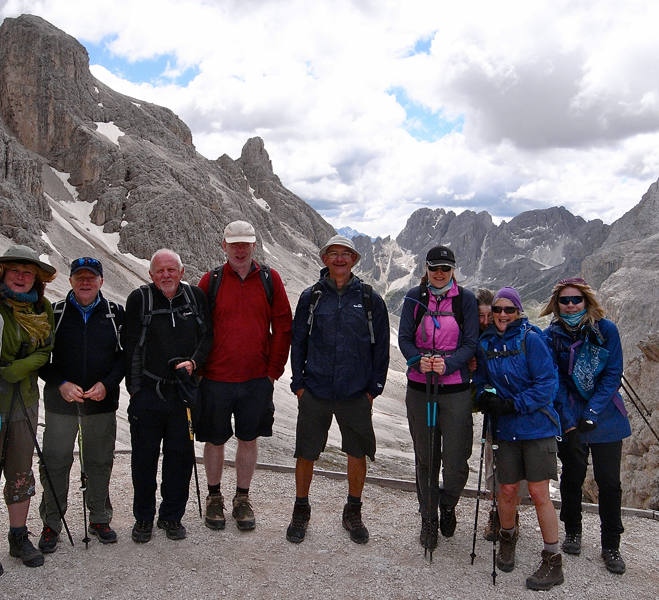 We return to Ciampedié and walk back to Vigo di Fassa through woodland. We will take the local bus service up the valley to Campitello where we all take the cable car to Rif des Alpes (2400m/7874f). From Rif des Alpes we descend to Rif Federico Augusto (2298m/7539f) then take the high level Federico Augusto Path. This is a contour path which hardly climbs or falls, however it does offer spectacular and far reaching views. 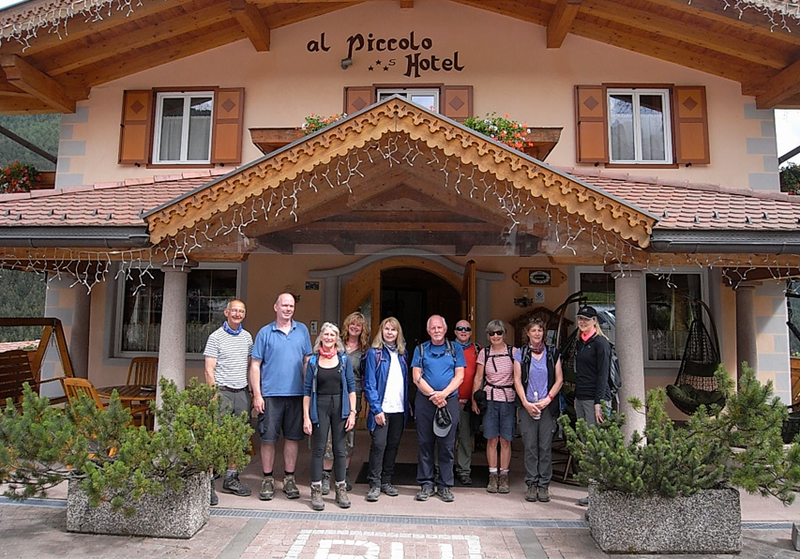 We will lunch at the Rif Sasso Piatto (2300m/7546f) and then descend to the Val Duron and Campitello to catch the bus back to Vigo di Fassa. We start with the riverside walk to the neighboring village of Pozza di Fassa where we take the cable car to Rif Bufaure (2044m/6706f). 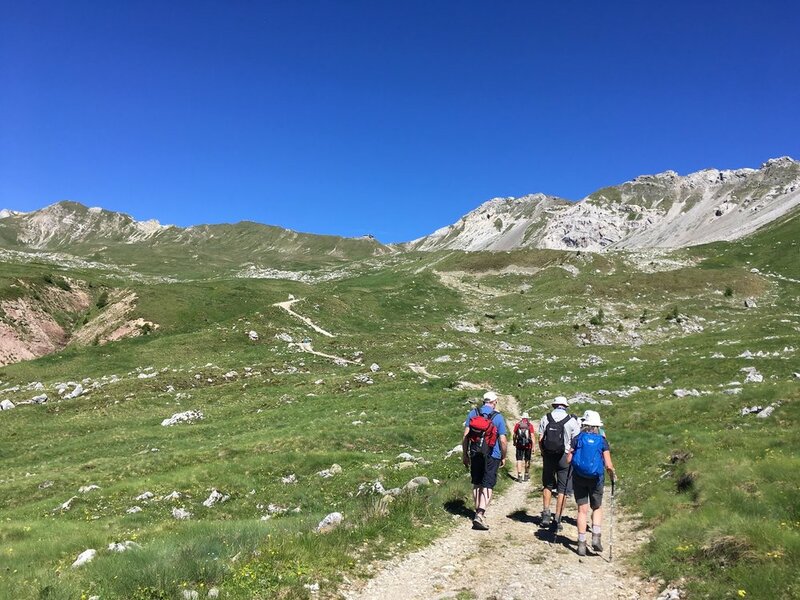 We then walk along the Sas De Adam Ridge (2430m7972f) to the ski resort of Ciampac and Rif Tobia del Jahger (2170m/7119). 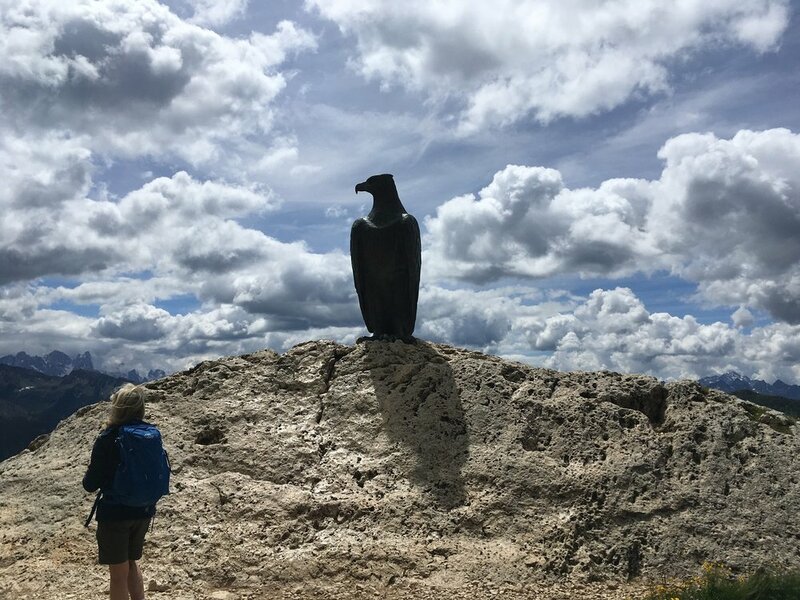 There is an option to walk down to the valley and catch a return bus or take the cable car to the valley and catch the bus back to Vigo di Fassa. Val di Fassa is located in northern Italy, nestled in the mighty spires of the Dolomites. As an area of outstanding natural interest and beauty, the Dolomites are a designated UNESCO World Natural Heritage Area. The valley is in Ladinia, a cultural area where the local Ladin language is still spoken and the Ladinia flag can often be seen. Italian is also spoken here, as is German due to the valley’s close proximity to the Italian province of Sudtirol where German is the native language. The Val di Fassa valley is the setting for a number of villages each with their own charm stretching from Moena in the south to Canazei in the north. 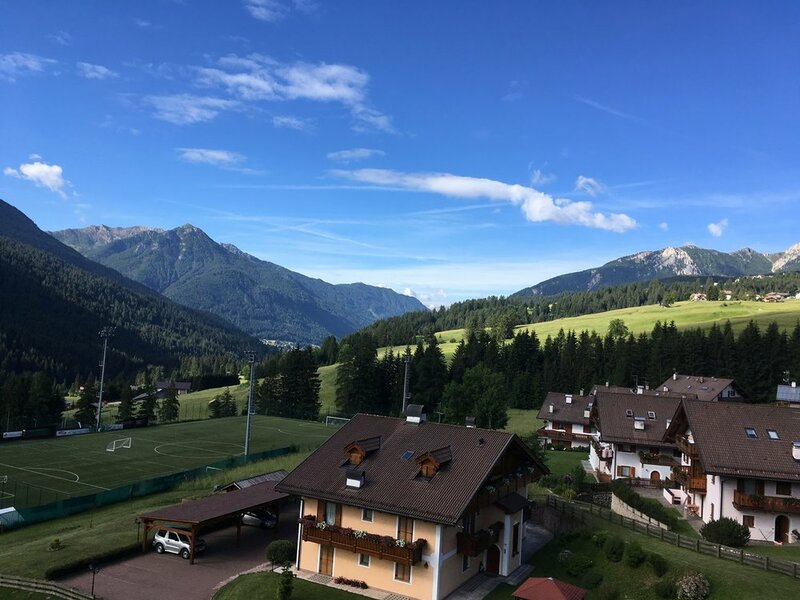 The area is popular as a winter sports resort; however, in the summertime, the region takes on another role as a prime destination offering endless options of mountain walks with an abundance of chair lifts and cable cars to elevate you quickly to the main walking areas. We are based in Vigo di Fassa (1382m/4534f) situated below the Catinaccio mountain group. Visitors will be enchanted by the beauty of these mountains which can be easily reached from the town center by cable car to the panoramic plateau of Ciampedìe, a starting point for many paths and mountain routes. Vigo became an important cross roads in 1895 when the first section of the Dolomites’ road was completed. 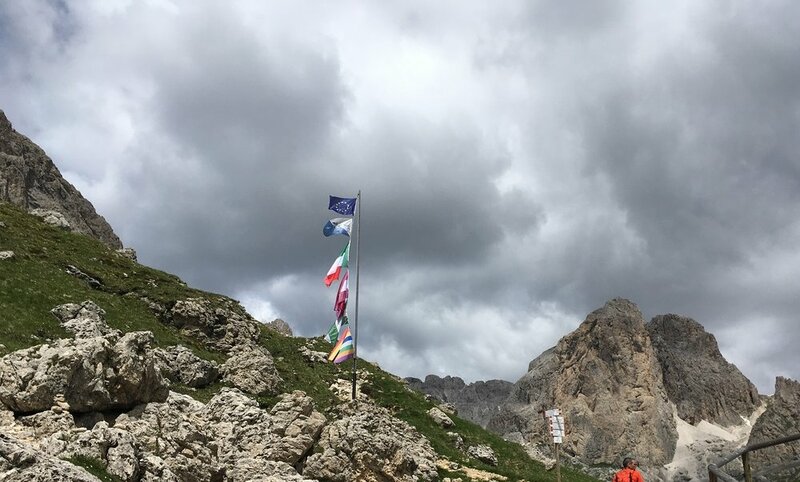 This was the Nova Levante – Passo di Costalunga – Vigo di Fassa which opened up the Fassa Valley and allowed tourism to flourish. Getting to the Dolomites holiday. The price for this holiday is land only and does not include flights from the United States to Verona. The hotel transfers included in the price are from the Verona Airport and it is recommended that you arrive at the airport for the scheduled transfer time(s) which will be identified at the quote stage. We attempt to accommodate all guest arrival times and when there are conflicts, we will do our best to facilitate reasonable transfers and that may require a supplemental charge to the transfer rate. Other options include flying into Venice or Innsbruck. 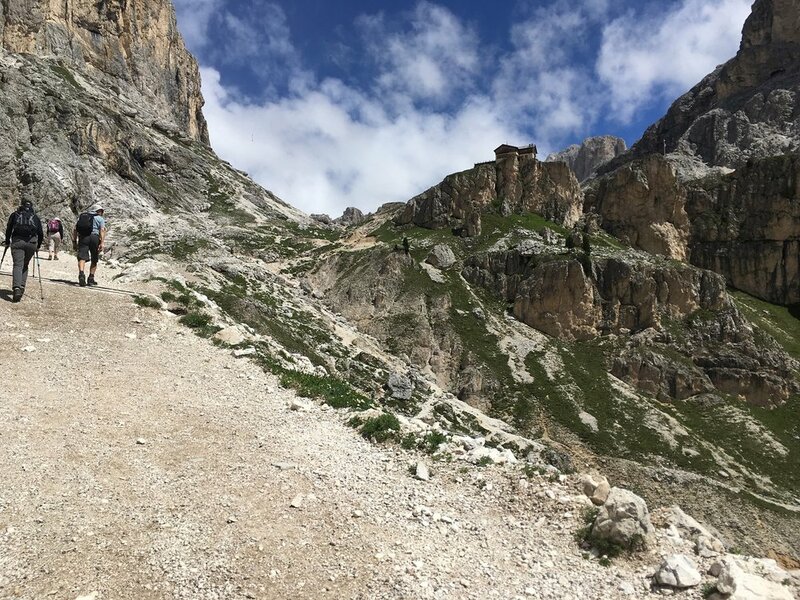 Vigo di Fassa is a bit off the beaten path, adding to its attraction in our opinion; however, being aware of the transport required is important. It will be necessary to take a 2 to 3 hour train ride from all nearby airports to Bolzano where we pick you up by private car and transport you to the hotel. There may be supplemental charges but there may be a savings in the flights that are offered to these locations. We can help you look at all those options during the quote period so that you are able to make a decision on how to best reach the destination considering costs and convenience. Airfare may range between $600 - $1,500 round trip between the United States and Italy, depending on where your flight originates, the time of year and when you make your booking. Budget airlines from several European capitals may offer a better price if you are adding onto a trip to other European countries. Please note that the published holiday dates are the dates you arrive in your holiday area and not when you leave the United States. Passport and Visa Requirements for U.S. Citizens. Passports must be valid for at least six (6) months beyond the intended date of departure. It is further recommended that your passport have at least four (4) blank pages. Non-EU visitors must obtain a stamp in their passport upon initial entry into a Schengen country. Consult the U.S. Department of State’s website for the most current country requirements. No Visa is required for stays up to 90 days. Weather. The average temperature in early summer is between 57 and 70 degrees Fahrenheit (14 - 20 Celsius) and at night expect the temperatures to go down to about 42 to 54 degrees Fahrenheit (6 – 12 Celsius). Mornings may be misty and likely chilly but the days will warm up quickly as we are high in the mountains 2,000m/6,560f. You will need layers to accommodate the changing conditions. In addition, always be prepared for a shower - in the event of rain, options include a poncho, an umbrella, or carrying rain gear to protect your clothing and backpack. Official language. Italian is the official language with German, English and Ladin also spoken.